One of the many enjoyments of summer is eating a freshly picked, sweet and juicy peach. We have a farm down the road which grows peaches, and it is always a highlight of our summer when the peaches are ripe and ready for us to purchase and eat. The other day, though, someone asked me how I get peaches off their pits for making pies and cobblers, and I explained that I didn’t. Peaches come in two varieties, clingstone and freestone. Both yellow and white peaches can be either. The irony is that the variety which is most difficult to remove from the pit, the clingstone, is the sweeter and juicier of the peach varieties. The peaches which fall off their pits, the freestone, are not as sweet and juicy. Most of the peaches one finds at the grocery stores are the clingstone variety because they are sold for taste. Hence, my friend’s frustration with removing the peach slices for baking. If folks want to make peach pie or cobbler or crisp or muffin or cake using fresh peaches, the best option is to purchase freestone peaches which easily twist off the pits if the peach is ripe. If using clingstone peaches, then folks need to resign themselves to cutting the peach slices off the pit which means the slices won’t be pretty. I don’t tend to do either, because as anyone who has followed my blog for a while knows, I am lazy and like to cook food as easily and quickly as possible. So I keep frozen, no sugar added peaches in my freezer and just pull them out when I have a hankering to bake with peaches. The fresh peaches, I just eat as a snack, enjoying their flavor as is. 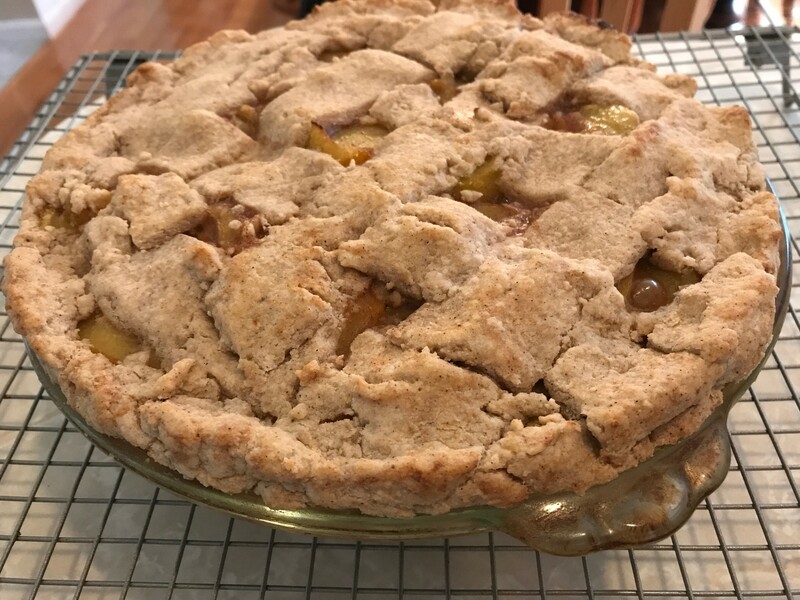 The conversation with my friend of course gave me a craving for peach pie, so I went ahead and baked one yesterday which I’ll share below. You’ll note that there’s no sugar and very little sweetener at all because the flavor and sweetness comes from sauteing the peaches to concentrate the flavor and sweetness. Folks can also switch up the spices to your own tastes. Sometimes I like to use cardamom and ginger instead of cinnamon and nutmeg. Some thoughts on pie crusts, too. I made my own, but folks can use a store bought pie crust, whether gluten free or wheat. If you choose to make your own, you can follow a favorite recipe. Otherwise, some information for your use to to make your own pie crust. Pie crusts are basically flour, fat and water. For every one cup of flour, whether wheat or gluten free, you will usually use 3 to 6 tbsp of a fat, whether butter, shortening or oil, or a combination of the three, and for every cup of flour you usually need 1 to 3 tbsp of water. Depending on tastes, some recipes call for a little bit of salt; others call for the addition of a little bit of sugar. I tend to use neither, opting instead to flavor my crust with spices like cinnamon, cardamom, nutmeg, ginger, cloves, etc…. If using solid fats, the colder the better: Put your butter and/or shortening into the freezer for ten minutes before cutting it into your flour. This is especially good for dairy free versions of butter which tend to be softer in texture. You want the fats to slowly melt in the oven while cooking, not become soft while you’re still preparing the crust. If using oil, the milder the better: Plant oils are great for crusts because they have healthy fats and you don’t have to cut the fat into the flour. You can simply stir the fat into the flour. You want, however, to use mild tasting oils like safflower, sunflower, canola, etc… because otherwise the oil flavor overpowers everything else. If you are using an oil for the fat, be sure to decrease the amount of water because you only want enough liquid to moisten the crust enough to hold together. The colder the better for the water: Recipes for crusts will call for ice water. This means literally putting ice into the water, because you want to prohibit gluten development. Now, if you’re making a gluten free crust, that isn’t an issue but if you’re using solid fats, the cold water will help keep the fats cold until the pie goes into the oven. Use just enough water, though, to moisten the flour enough to hold together. If you want tender, flakier crusts, use acids or alcohol: Acids like lemon juice or vinegar or an alcohol like vodka cook off in the baking process but react with the other ingredients to make for a flakier crust by tenderizing the dough. You only need to replace one to two tablespoons of the ice water. If want tender, flakier crusts, use lower protein flours: The lower the protein, the flakier the crust, but of course, that makes for a more delicate crust and one which is more carb intense. Find a balance. For example, use a whole wheat pastry flour which has less protein than 100% whole wheat flour but which is a sturdier flour than all purpose white flour. If using gluten free blends, choose a combination of brown rice flour and sorghum or oat which combines a lighter flour with a protein flour. If you want a crust that is easier to handle: Adding an egg yolks makes for a more pliable, sturdier dough to work with. It also makes for a richer tasting crust. For easier rolling and handling, cold is better: It is a good rule of thumb to put your crust into the fridge for half an hour to an hour because rolling soft dough makes it more likely that the dough will stick, causes the fats to melt before their time, and will be harder to transfer to the pie plate. For easier rolling and handling, paper is better: When rolling out the dough, if you don’t want the crust to stick and want an easier way to transfer the crust, use wax paper or parchment paper which you sprinkle flour onto. After putting the dough down, sprinkle it with flour and top with a second piece of wax or parchment paper. Then roll. The papers prevent sticking, and when you’re ready to transfer the crust, you can just pick up the paper and flip it onto the pie plate.